Without question, the economy has taken its toll on the manufacturing sector. Despite this, Regency Plastics is finding significant opportunities, and has the financial strength and experience to perform in the harshest of environments where tooling and part production are transferred overnight. How can Regency help make your project a success? Our express intent with every new opportunity is to determine if there is a good fit allowing us to provide you with precision blow moldings. If a good fit exists, we will assist you with design, material and process selection, pricing, logistics, quality, and resolving DFM/DFA issues. On the other hand if there isn’t a good fit, we'll do our best to connect you with someone who can help. 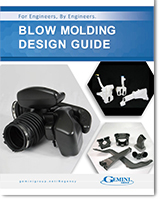 Black box blow molding design requires innovative thinking. As a Tier 1 and Tier 2 supplier, Regency is comfortable being responsible for the entire design process or assisting you as a design partner. Being Horizontally Integrated gives Regency Plastics the upper hand when determining material and process constraints and limitations, as well as the confidence to stand behind our work. An exceptional understanding of how to drive cost out of a product is a skill and discipline that differentiates Regency Plastics in the global marketplace. Speed is everything. Whether you need parts in less than 24 hours or in one week, Regency has the in-house resources to meet your deadline. Depending on your need Regency can produce tooling from wood, epoxy, aluminum, and steel to produce parts for appearance evaluation or physical testing. Undoubtedly, a major factor influencing the success of your project is the performance of the entire supply chain. Given this, Regency Plastics is committed to procuring low cost, quality components and raw materials from leading industry suppliers. All of our blow molding production tooling is built in-house thus eliminating wasted time and costs associated with engineering changes. Every program has a cross functional team dedicated to managing your program from commencement to production. Though the use of Advanced Production Quality Planning (APQP), Regency evaluates each step of your project upfront allowing us to optimize the process and identify areas to drive cost out of your product and reduce time to market. To ensure that the material properties, tensile strength, push/pull, load, thickness, and all other specifications for your blow molded products are met; Regency Plastics conducts blow molding testing before (PPAP – pre production approval process) and during the blow molding process based on your blow molding design and requirements. Our blow molding testing process involves a Material Thickness Analysis, Leak Testing, and the use of Spectrometers to ensure your parts optimum performance regardless of final application.